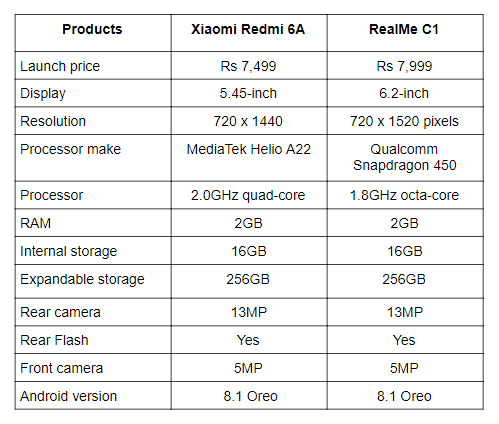 Today, we are comparing two budget smartphones, the RealMe C1 with the Xiaomi Redmi 6A to see which one is the most valuable device in terms of specifications. The RealMe is giving a tough competition to Xiaomi due to the price range they are targeting. The RealMe C1 is a budget smartphone that comes with a Qualcomm Snapdragon 450 octa-core processor and a notch on top of the display. The smartphone is priced at Rs 7,999 in India. On the other hand, the Redmi 6A, which comes with a 13MP rear camera and runs on a MediaTek chipset is available for Rs 7,499. Let’s see which one is the better budget smartphone among these two when it comes to hardware. The RealMe C1 comes with a bigger 6.2-inch display in comparison to the Xiaomi Redmi 6A, which sports a 5.45-inch display. The RealMe C1 also offers a better resolution than the Xiaomi Redmi 6A as you can see in the sheet above. When it comes to the processor, the Xiaomi Redmi 6A is powered by a MediaTek Helio A22 processor, while the RealMe C1 is backed by a Qualcomm Snapdragon 450 processor. When it comes to the cameras, both devices are equipped with a 13MP unit on the back along with a 5MP sensor at the front. The difference between these two devices is not major as what it looks on paper. 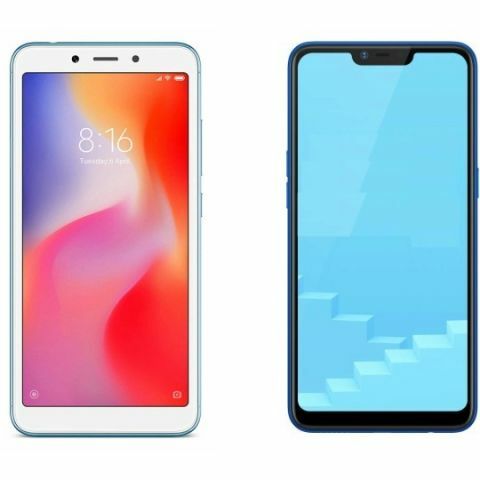 The Redmi 6A is available for Rs 7,499 on Amazon, while the RealMe C1 is on Flipkart at Rs 7,999.